If you happen to be a traditional man (or a traditional woman for that matter), times look pretty bleak. 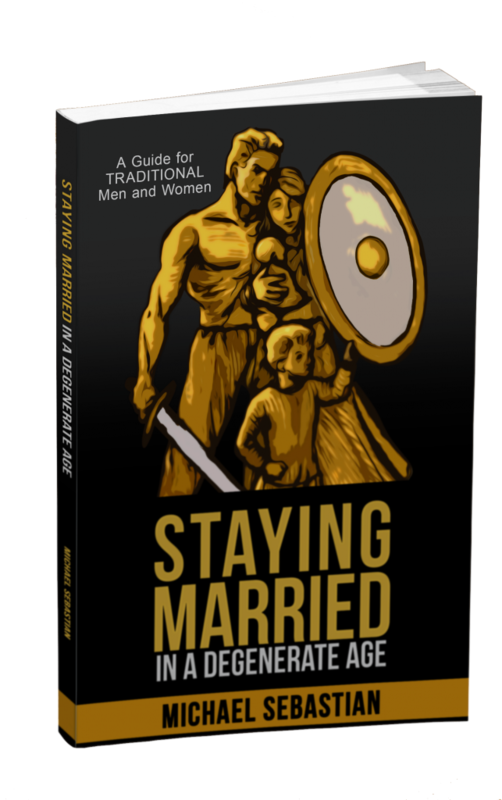 If you happen to be single and you are looking to get married, you already know that you face a tough market. To often, the women are jaded or easy while the men are wimpy or slimy. The working world has also undergone a revolution. Most white-collar jobs now consist of working in a giant cube farm. Easy network connectivity means that a 40-hour workweek is no longer the norm. Companies expect their workers to be available 24×7. We end up living to work rather than working to live. The political situation is no better. In the US, both political parties are beholden to big money interests. Politicians give lip service to the interests of voters but dance to the tune dictated by the people and institutions whose money keeps the pols in office. If you are in the dating market, it is true that your viable options have decreased. Yes, the sheer number of men and women has remained the same, but lots of people remove themselves from being viable options by their actions. …you are already better than 80% of the men out there. If you go to the gym and stay in shape, you are better than 90% of the men. If you have a good financial game, you are in the top 1%. While the corporate employee environment is getting worse, and I predict it will continue to decline, building additional streams of income has never been easier. The big change is the rise of the internet. It has probably never been easier to start a business for little capital. Software distribution has never been easier. Back when I first started working, the only way to get software into the hands of customers was to hire a sales force and a marketing department. Even if you could write incredible code, you had no hope of being able to start a company without outside investors. But with the advent of the Apple App Store, talented programmers can now sell their software directly to the consumer. Even if it is not an app that generates millions in revenue, it can still be a healthy supplemental income that will lead to financial freedom. Authors no longer have to rely on the whims of agents and publishing houses to get their work into the hands of their readers. Mike Cernovich over at Danger and Play has sold 5,000 copies of a self-published book. Tim Ferris was able to launch the best selling supplement, brainQUICKEN, while he was he was still working in a full time job. The amazing thing is that he was able to do it with only a $5,000 investment. Victor Pride at Bold and Determined started a blog that earns $10,000 per month. I am not implying that these are easy feats to achieve. They all require a high degree of skill and tons of hard work. The good news is that the information you need to learn these skills can usually be had for little to no money. All that is required is your time. Want to read about how men like Andrew Carnegie, Benjamin Franklin, and Henry Ford amassed unimaginable wealth? Their autobiographies are available for FREE on Amazon Kindle. Would you rather read books by more recent entrepreneurs? They are in your public library, again for free. If you want to learn to write a blog, publish a book, start a supplement business, or learn how to code in Swift, you can do it all without having to buy anything. Do you want to learn a skill in a more systematic way? For relatively little cost (or no cost) you can take a university course from the comfort of your own home. Discouraged by the moral rot that you see around you? Don’t be. You can be grieved by it, but don’t let it bring you down. It may be a minority, but there are always a large number of people who possess a natural nobility. Their souls naturally reject the lies that our culture throws at them. Even if they are slightly taken in by the indoctrination, they can’t be fully corrupted. As soon as they see beauty or hear truth, they immediately embrace it. Live your life at a higher level and you will connect with these people. The political situation looks grim. Things are decaying faster than we could ever have imagined. Even so, most of the decisions of the politicians have little effect on our daily lives. You could stop reading the news, stop voting, and just go about your business and still remain perfectly happy. But I am not recommending tuning out. I recommend fighting with everything you got. Vote for the least repellant candidate. If nothing else, it slows down the rot. Get involved in local politics to influence things for the good. By the way, that is how the Kennedy family first became established. The family was part of the Boston elite long before Joseph Kennedy Sr. made his fortune, and they did it by participating in local politics. If you have the mojo, run for higher office. If you have morals and you are able to read, you are already light years ahead of most of the current crop. Whatever you do with politics, never take it too seriously. Have fun with it. Thank you for the inspiring post. Yes I agree, we must be optimistic despite all signals we get from the surrounding reality, that want us to be pessimistic. I think we must never lose the planning quality, the ability to have a vision and fight for it. I think that if you are asked to define masculinity by one single ability, the one that better fits is exactly this: to have a vision, to believe in it and to fight for it till the end of life. Today I spoke with a very good friend of mine: he feels hopeless because beside some health issues, he does not like his current job (he has a corporate job, and he is doing quite well but he does not like the human environment there), his parents have some health problems as well and finally he has no girl friend right now. I think it is very difficult in such situation to find the right words to encourage somebody, especially a very good friend of yours. Sometimes even your faith seems not enough to sustain you (my friend is a catholic believer). This is the reason I mostly appreciate your post and all the work done in your blog: you try to find the words that one wants to address to a friend in need and diffilculty. I like your definition of masculinity: “to have a vision, to believe in it and to fight for it till the end of life.” This gets right to the core of what it means to be a man. There are a lot of things you can criticize about Catholicism, but this one thing is certain: It is the only philosophy gives meaning to suffering. Even while facing illness or death, there is still meaning to all of it, but one must have a deep prayer life to experience it. Encourage your friend not to let bitterness take root in him. I’ve met lots of men who become bitter with life as they get older because life didn’t turn out exactly how they wanted it to. But that attitude can actually stop them from actually achieving their goals.